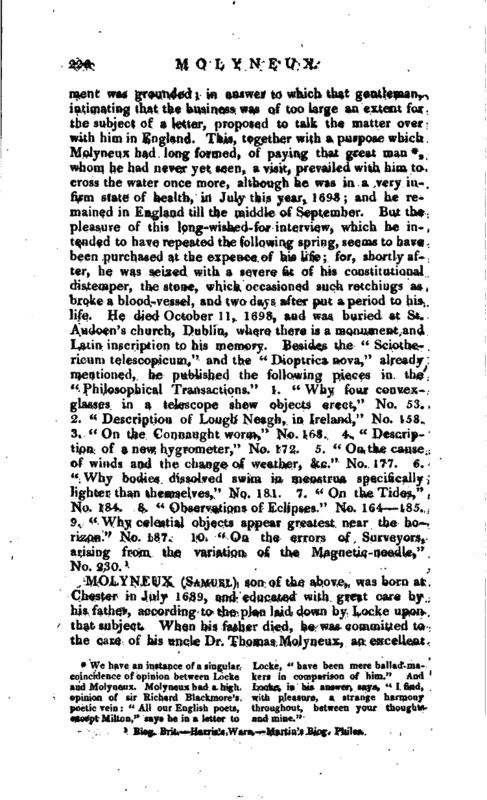 WORDS: BIOG: Molyneux, William, Esq. * His family were all lovers of treatise on gunnery, written by him. Pieces." It was printed on copper- was published, plates, and collected from a larger | well as by the strength of his parts; and, having made a remarkable progress in academical learning, and particularly in the new philosophy, as it was then called, he proceeded at the regular time to his bachelor of arts degree. After four years spent in this university, he came to London, and was admitted into the Middle Temple in June 1675. He staid there three years, and applied himself to the study of the laws of his country, as much as was necessary for one who was not designed for the profession of the law; but the bent of his genius, as well as inclination, lying strongly to philosophy and mathematics, he spent the greatest part of his time in these inquiries, which, from the extraordinary advances newly made by the Royal Society, were then chiefly in vogue. Thus accomplished, hfc returned to Ireland in June 1678, and shortly after married Lucy, daughter of sir William Domvile, the king’s attorney-general. Being master of an easy fortune, he continued to indulge himself in prosecuting such branches of moral and experimental philosophy as were most agreeable to his fancy; and astronomy having the greatest share, he began, about 1681, a literary correspondence with Flamsteed, the king’s astronomer, which he kept up for several years. 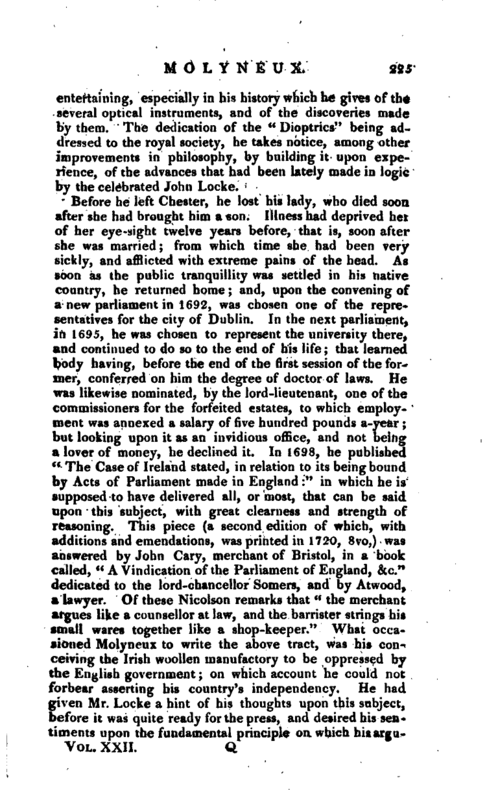 In 1683, he formed a design of erecting a philosophical society at Dublin, in imitation of the royal society at London; and, by the countenance and encouragement of sir William Petty, who accepted the office of president, they began a weekly meeting that year, when our author was appointed their first secretary. 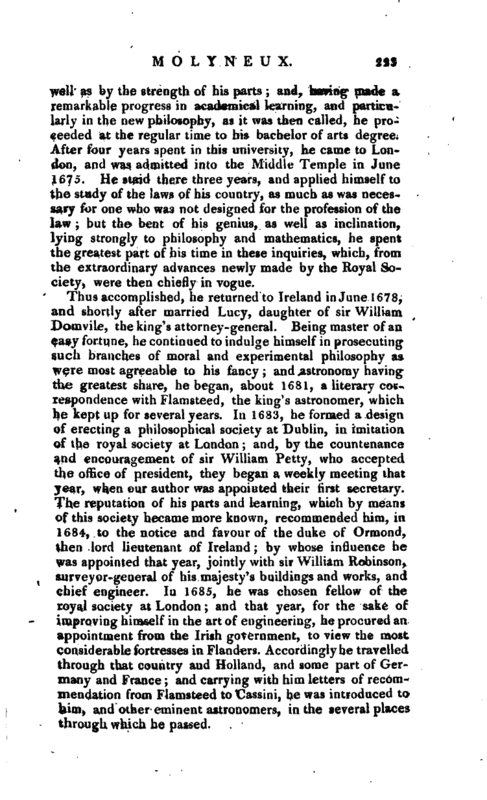 The reputation of his parts and learning, which by means of this society became more known, recommended him, in 1684, to the notice and favour of the duke of Ormond, then lord lieutenant of Ireland; by whose influence he was appointed that year, jointly with sir William Robinson, surveyor-general of his majesty’s buildings and works, and chief engineer. In 1685, he was chosen fellow of the royal society at London; and that year, for the sake of improving himself in the art of engineering, he procured an appointment from the Irish government, to view the most considerable fortresses in Flanders. Accordingly he travelled through that country and Holland, and some part of Germany and France; and carrying with him letters of recommendation from Flamsteed to Cassini, he was introduced to him, and other eminent astronomers, in the several places through which he passed. | Soon after his return from abroad, he printed at Dublin, in 1686, his “Sciothericum telescopium,” containing a description of the structure and use of a telescopic dial invented by him: another edition of which was published at London in 1700, 4to. 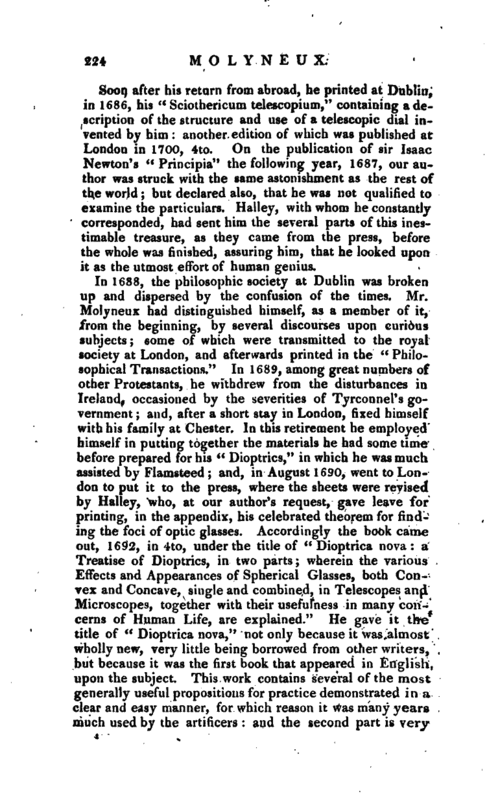 On the publication of sir Isaac Newton’s “Principia” the following year, 1687, our author was struck with the same astonishment as the rest of the world; but declared also, that he was not qualified to examine the particulars. Halley, with whom he constantly corresponded, had sent him the several parts of this inestimable treasure, as they came from the press, before the whole was finished, assuring him, that he looked upon it as the utmost effort of human genius. In 1688, the philosophic society at Dublin was broken up and dispersed by the confusion of the times. 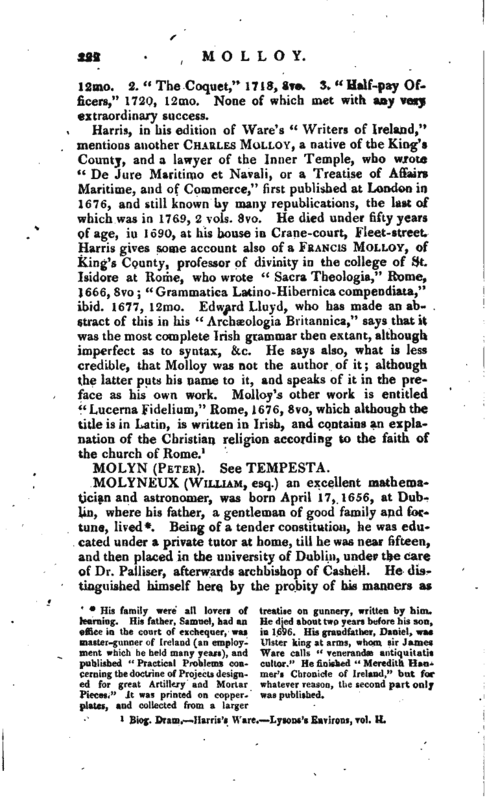 Mr. Molyneux had distinguished himself, as a member of it, from the beginning, by several discourses upon curious subjects; some of which were transmitted to the royal society at London, and afterwards printed in the “Philosophical Transactions.” In 1689, among great numbers of other Protestants, he withdrew from the disturbances in Ireland, occasioned by the severities of Tyrconnel’s government; and, after a short stay in London, fixed himself with his family at Chester. In this retirement he employed himself in putting together the materials he had some time before prepared for his “Dioptrics,” in which he was much assisted by Flamsteed; and, in August 1690, went to London to put it to the press, where the sheets were revised by Halley, who, at our author’s request, gave leave for printing, in the appendix, his celebrated theorem for finding the foci of optic glasses. Accordingly the book came out, 1692, in 4to, under the title of “Dioptrica nova: a Treatise of Dioptrics, in two parts; wherein the various Effects and Appearances of Spherical Glasses, both Convex and Concave, single and combined, in Telescopes and Microscopes, together with their usefulness in many concerns of Human Life, are explained.” He gave it the title of “Dioptrica nova,” not only because it was almost wholly new, very little being borrowed from other writers, but because it was the first book that appeared in English upon the subject. This work contains several of the most generally useful propositions for practice demonstrated in a clear and easy manner, for which reason it was many years much used by the artificers: and the second part it very | entertaining, especially in his history which he gives of the several optical instruments, and of the discoveries made by them. The dedication of the “Dioptrics” being addressed to the royal society, he takes notice, among other improvements in philosophy, by building it upon experience, of the advances that had been lately made in logic by the celebrated John Locke. Biog. Brit. Harris’s Ware. Martin’s Biog. Philos.